Our first ever guest appearance for the new product post. Hello everyone and welcome to another Friday New Product Post. This week is a first for us - we had our first guest appearance by for our weekly video. Eric from Modular Robotics was kind enough to stop by and help me explain their new product. Check out the video. Cubelets really are a blast and it's great to play with a wide assortment of them. There are a lot of possibilities and you can really come up with some amazing little robots. 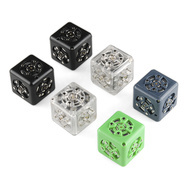 Cubelets are miniature robots that magnetically (magically) snap together to create whatever you can imagine (within reason). Each one has a different function. Some are sensors, some perform specific actions (motors or lights), and others provide power or just help to connect others. There's really no wrong way to connect them. Because of their clever design, you determine their behavior by simply putting them together. If your robot is moving in the opposite direction, just reverse the sensor. Now you can intuitively build complex robots without programming or prototyping. Pretty neat. It's everything you love about the Maple, just smaller. 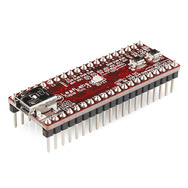 With the Maple Mini, you lose a few pins, but you gain the ability to put it in a breadboard. With an ARM Cortex M3 and 34 I/Os, this board has a lot of potential applications. And for everyone that's familiar with the Arduino IDE, you should feel right at home using the Maple IDE. Unfortunately, not everything has USB. 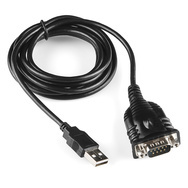 Many devices still rely on RS232, but most modern computers have done away with the DB9 connectors. Converters can be tricky because they don't always work. We have been carrying one for some time, but it hasn't been as reliable as we'd hoped. It works a good amount of the time, but not ALL the time. This new RS232 to USB converter uses a trusty FTDI chip to get the job done. It's a few more bucks, but if you had a problem with the old one, it will be well worth it. I hope there's something up there that sparks your interest. If not, we'll be back again next week with more products. Judging from the pile of new stuff on my desk right now, there will be some good stuff, so be sure to check back. I sense it's going to be a bright week for new products. Your robot "steers" just like everything else does. You designed the individual parts to work a specific way, and then you configured them to work together to accomplish a specific purpose. You actually "designed" the whole system from the ground up. I don't necessarily disagree with your views, but your argument makes no sense. The demonstration of your cool robots is much appreciated. Your soapbox commentary on your particular world view.... not so much. Cool robots, though! Keep it up! I completely agree with Menny here. If anything, this guy is nicely making the case FOR a Designer not against. I'm sorry he has some axe to grind with ID but what does that have to do with cool electronic stuff? Please tell him to go find some evolutionary/ID blog/website/forum and pour out his ideas until his heart is content. This just isn't the right place for it. SparkFun has always been a really 'fun' site to go to. Crapola like this cubelet rep's comments really put rain on the parade. Yeah, +1. Have your beliefs, because without them we're nothing, but grind your axe on your own axe grinder, not on someone else's workbench. I don't think you fully understand what he meant. Yes he designed and programmed each block to have a certain function, but what he was trying to tell is that every particle in the universe has a certain function as well due to laws of physics, so when particles with different functions come together, they start forming even more complex functions. And it's not a "world view," it's one of the greatest things about science; it's true weither you believe it or not. And arguing about cubes being designed is like saying "a picture that illustrates evolutionary tree was drawn by a human, therefor Intelligent Design!!11!" +1 on that. You guys need to lighten up, I think the majority of sparkfun users would applaud this as a very creative tool for educating kids in science, including an area which for some reason has become a very controversial one. I say for some reason because evolution is not a religious belief it is a scientific principle, and I would hope that sparkfun is science based, and would take that position. It has been a while since the world was flat. My world was never flat! But I do know that no science has ever proven the THOERY of evolution. But that's the great thing about science, present an idea and test it against known models and formulas of the time and determine if it can be supported. Evolution is not a scientific principle, just a theory. Let me know when science has been able to conclusively prove our origins began in a primordial stew. Gravity is also just a theory. What you have to understand is that the word "theory" has a different meaning in a scientific term and evoltuion is a theory with an overwhelming amount of evidence. The meaning of scientific theory. I also agree with the other guys here.... Sparkfun rocks and so do their contributors, I check their site every day and buy as much of my stuff from them as possible. However, this is not the place for personal views. Please refrain from allowing personal beliefs from being presented as fact. I personally disagree with the cublets creator in views and do not want my kids listening to his views (they love watching Sparkfun videos). Thanks for listening and keep up the good work! It's a free world, everyone should be allowed to express what they believe just as religious people express their beliefs every morning when they knock on my door to save my soul. I'm sorry that you're trying to close your kid's minds before they have even been opened yet. so I'm going to assume you don't have kids yet. Otherwise, it's time you take responsibility for raising your own kids. It's not societies job to raise our children and fill their heads with every idea and belief out there. The argument you've used here is hypocritical since you are imposing your belief that kids are harmed by not being exposed to every emergent belief system available. I have not shared my beliefs here and will not share them here since "knocking on doors" doesn't save souls. I simply stated that there is a place for sharing personal beliefs and I don't believe that place belongs in the public face of a corporation. I don't care if Sparkfun employee's want to share their beliefs, if their guests want to share beliefs, or customers want to share beliefs....It just needs it's own venue to avoid the very thing that happened in this post. You took the words right out of my mouth. Cool robot cubes. Terrible argument filled with fallacies. That was a cool demo of the cubes but the robot was still designed. His point would only be valid if you put all the blocks in a box shook it up and then by chance a fully working robot came out. I agree. He knew the behavior of each block and designed a system based upon the combined behaviors. But in his example he still designed it to turn it did not happen by accident. I still do not see his logic that the behavior just emerged. I see what you're saying. His point is that you're not really 'programming' a differential drive system based on a differential sensor input. You're simply putting blocks together and they follow a function based on the form of their assembly. His example was simple but if you take it further and have several dozen little robots that all do a very small task (driving forward unless they see light, and then going left or something), they would form a group behavior. The whole concept of emergent behavior is based on systems in nature like ants, bees, etc. Basic reactions (behavior)to input (stimuli) create much more complex systems when scaled up. Check out their video on the product page, it goes into this a bit. I know this is a weird question but do you know when spark fun is going to make there stock market debut? They'd have to be a publicly traded company to be listed on any stock-market. As I recall, Sparkfun is privately held and will likely stay that way for the forseeable future. Not every company needs to go public, for one thing it would be harder to maintain the employee friendly environment if they "go corporate". this. we're going to be privately owned for a very long time. Very cool product, and it should have been left at that I think is the overall theme here. If that one little comment would have been left out of his commentary everyone on this thread would be talking about the bots. Instead you have a mini debate about intelligent design, god, etc and not about electronics and the wonderful things you can create from them and what they can teach you. Yes, that makes more since that they were not programmed but designed by combining simple behavior of each module. Thanks for making that more clear. Think about it from a kid's point of view. We are all techies, we mostly know how stuff works. And most importantly because we know how stuff works, we come up with ideas of how we WANT stuff to work and end up hacking our stuff together. Kids don't have this knowledge initially. This exposes them to the possibility that stuff CAN happen. Knowing how and wanting it to do stuff is what comes afterwards. Discovery is the first step. Neat little devices, but I think it is a far stretch of the imagination to call call each one a robot. Additionally, and more importantly, the soliloquy on evolution is out of place. This isn't emergent behavior, it is preprogrammed on microprocessors. You are entitled to your opinion on evolution, but if you look around you at the world we live in, you should think again whether or not it was done so by accident. At any rate, this is a electronics video and not the appropriate avenue to make such statements. Aggrivates me enough to avoid your product altogether. I agree with you; it was very out of place, and extremely disappointing. I think a lot of people need to spend ten minutes reading and absorbing the wikipedia article on emergence. This IS an excellent example of simple emergence; there is no steering or turning function, yet the machine clearly steers and turns. As a collective, the functionality or ability is more than the individual parts. Nobody has to get more philosophical about it on either side. For those interested, there's an interesting set of thought experiments on simple robot behaviors in the book "Vehicles" by Valentino Braitenberg (wikipedia: http://en.wikipedia.org/wiki/Braitenberg_vehicle). Gets a bit deep after the first few chapters, but we've similar ideas building BEAM style robots for a long time using this sort of design philosophy. you didn't "program" steering, but there was some level of design going into the order that those blocks went together. why are the educational, engineering-based toys always the most expensive? From talking with Eric, there are MANY regulations that makes producing 'toys' very expensive. Materials testing, certification, etc, etc. Same for kids clothes if you are a silk screener. Right. I really like the idea of "emergent" behavior, but that's just not how it works in the real world. I think that it is a complete disservice to kids to teach them that all you have to do is snap a bunch of parts together and something cool will come out. No! These parts required a lot of thought, design, and engineering to construct so that they would work well together. This toy is another reason that Engineering is a disappearing profession. Engineering is a way of making imagination turn into reality. Anything that raises questions, in my opinion, nourishes an engineering spirit. Keep in mind that a lot of engineering went into LEGO blocks as well. This is a toy that's meant to inspire kids to think about complex behaviors as the sum of simpler behaviors. High level robotics, not design and construction. You will be happy to know, however, that the blocks are themselves programmable and that lower level control is a feature that may be available in the future. Ahhhhh! The Borg are comming. Your not meant to, actuely apple spends thousands of dollars making sure people don't. What did you mean? Exactly, someone else created complex hardware and software. And the same is for the cubes. Since his argument is so broad the cube itself has to support the base case which it doesn't. I'm hooked on the STM32s after playing with one of ST's Discovery boards. You guys should build something similar to this but with the STM32F4. Hell yeah. Embedded ARM with floating-point hardware! Even without shaving for a week, I wouldn't meet the facial hair requirement for cubelets. don't worry, all the facial hair is done in post processing. Where is your BEARD! man ! DON'T DO THAT! Kept hearing that the Maple IDE looks like the Arduino's so went to check it out at Leaflabs: http://leaflabs.com/docs/ide.html Yeah they do look 'similar' and the language reference guide often points to the Arduino page for more info. Might try out the larger maple for fun and see how it works. I have the "normal" (Arduino form-factor) Maple, and can offer a few opinions. Keep in mind I don't use shields so those aren't important to me. The IDE is the same, the language is the same, the library has some small (and very welcome) differences. For example, use of analogWrite() is replaced by pwmWrite() (much more accurate English, plus Maple Native will actually have a DAC on it (so I hear) to possibly use a real analogWrite()). The integer types are different of course, being a 32-bit architecture; keep typedefs or use the ones existing for uint8, int16 etc. to have to avoid porting integer types. There's some pin issues with certain shields; a Google search will help you determine shield compatibility, and so will LeafLab's site/forum. That said, the ChipKit UNO (SF, please look into carrying?) runs a hair faster clock (80MHz PIC32) that seems to get a huge digital I/O speed boost over the Maple. I assume one does not largely excel in number crunching over the other though. Friday Product Post: CAN You CAN-CAN Like Offenbach?